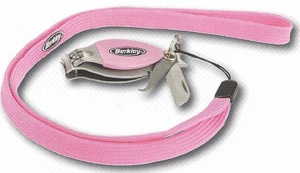 BERKELY LADY CLASSIC STAINLESS STEEL LINE CLIPPERS These line clippers feature PVC coating on the thumb grip; corrosion-resistant 420 stainless steel material; multifunctional, blade, pick/jig buster and lanyard. They are suitable for fresh or saltwater use. Pink.